This article cannot really be appreciated without relevant background and history, so you are going to have to show a little patience with us on this one, but in the end, it will be very rewarding inshaa'Allaah, and you will start seeing the bigger picture. Always remember, you can't understand what's happening around you now until you study the history of what led to the current. Then you can make connections and make sense of what is going on. 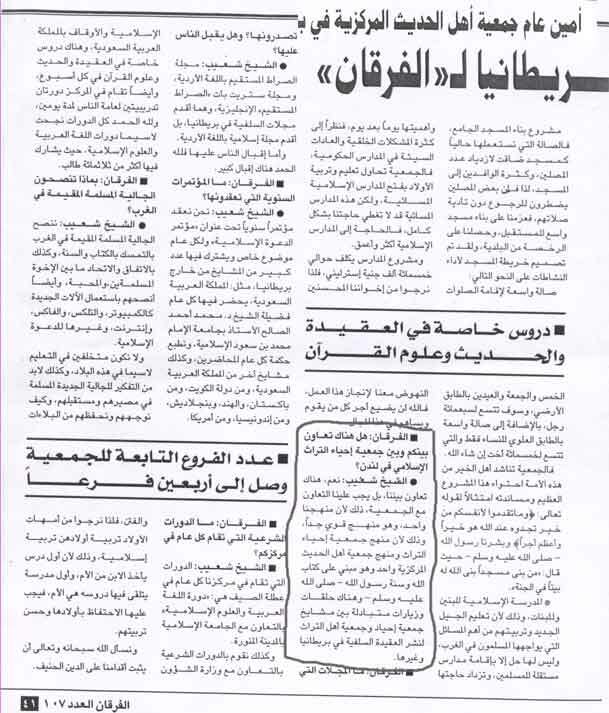 In this article we are going to try and make sense of the current fiasco behind the MJAH-GLM conference of September 6th-8th 2013 in light of an article published in the Kuwaiti al-Watan newspaper today (September 11th 2013). The 2nd Wave (Kuwaiti Leg): Abd al-Rahman Abd al-Khaliq (Ikhwani from Egypt, moved to Kuwait and began calling to his Ikhwaniyyah). From his followers, Abdullah al-Sabt, Adnaan Abd al-Qadir, Abdur-Razzaaq al-Shayijee and other straying wanderers. Abdur-Rahmaan Abdul-Khaliq brought the two strains of Ikhwaniyyah to Salafi audiences not unlike the Ash'arites of the 5th century hijrah brought the doctrines of al-Jahm and al-Ja'd, clothing their denial of Allah's uluww and ru'yah in new sophisticated language aimed at concealing the reality of what they were saying and its true origins. In the same way, Abdur-Rahmaan Abdul-Khaaliq invented new slogans and principles by which he aimed to spread the ideology of Qutb and Banna to a Salafi audience in a covert manner. Destructive, forbidden and condemned splitting of the Ummah justified under the slogan of "permissibility of the multiplicity of groups (ta'addud al-jamaa'aat)," takfir of rulers and their governments justified under the slogan of "tawhid al-haakimiyyah" (as an independent fourth category of tawheed), engagement in corrupt political activity, through existing political structures, including entry into parliamentary democracy justified under the label of "legislated collective work (mashroo'iyyat al-'amal al-jamaa'ee)" and so on. The organization of Ihyaa al-Turaath - which operates upon and spreads the thought of Abdur-Rahman Abdul-Khaliq (who synthesized the thought of Qutb and Banna for a Salafi audience) became a vehicle for the spread of this destructive thought. With the wealth it amassed and continues to amass, it went and split Salafi communities across the globe, in Kuwait, Yemen, Sudan, Saudi and and they also began to operate in the West, coming to the UK and the US. The 2nd Wave (Saudi Arabian Leg): Salman al-Awdah, Safar al-Hawali, the Qutbiyyah of Saudi Arabia, tutored by Muhammad Suroor and Muhammad Qutb respectively, began calling to takfir and haakimiyyah and ideologies of Sayyid Qutb, and began to belittle the major scholars, tearing the youth away from them. Al-Hawali pushed the takfir and haakimiyyah whilst Salman al-Awdah (alongside his mass, unrestricted takfir) laid down false principles and authored works to push the principle of Hasan al-Banna of cooperation with people of different creeds. His novel approach (to augment that of Abdur-Rahman Abdul-Khaliq's) was to differentiate between al-firqah al-naajiyah (the saved sect) and al-taa'ifah al-mansoorah (the aided group). He claimed that the aided group are the people of hadeeth, sunnah and aathaar and as for the saved sect then all the various jamaa'aat enter into it. His objective was the same as Abdur-Rahman Abdul-Khaaliq's which was the same as that of Hasan al-Banna's. To mobilize the masses, irrespective of which creed or sect or group they belong to and get them involved in political work. We now move to subsequent waves, all of whom have connections to the Jam'iyyah Ihyaa al-Turaath to one degree or another. This is a crucial fact to note, in that all of the following individuals have or had connections (some of them financial) to Ihyaa al-Turaath or its sister organizations. 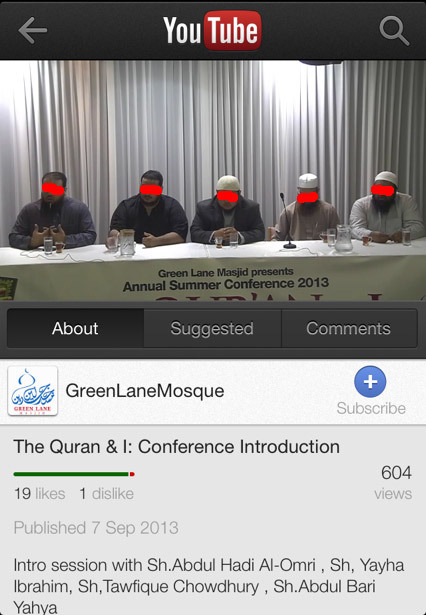 While Markaz Jam'iyyah Ahl al-Hadeeth (Green Lane Mosque) hereafter referred to as MJAH-GLM has had connections to Ihyaa al-Turaath, it may not have had any direct connections to the individuals below, even though the manhaj they all represent and implement is the same. The 3rd Wave: Adnan Ar'oor, Muhammad al-Maghrawi Then came Adnaan Ar'oor who laid down more sophisticated principles whose aims were the same as those of his precedecessors, but trying to veil the realities. From his principles are "we correct the mistake but do not disparage the person (nusahhih wa laa nujarrih)" which actually has the same objective as the golden principle of Hasan al-Banna. Although he was not the pioneer of this saying, he also pushed the innovated principle of al-muwaazanah, which requires that when refuting a person, his good elements must be mentioned too, to avoid oppressing him. This is a false, corrupt principle and in reality, the aim behind it was to neutralize the deserved criticism made against deviants and to protect their standing. He was refuted by a body of the Salafi Scholars. Then at the end of the last century, right at the end of 1990s, al-Maghrawi was taken to task for his mass takfir of Muslim societies and nations, and his revolutionary ideologies. This signaled a new era in the battle between Ikhwaaniyyah and Salafiyyah, especially considering that around this same time, three great Imaams of Salafiyyah, Imaam al-Albani, Imaam Ibn Baz, Imaam Ibn al-Uthaymeen, passed away (may Allaah have mercy upon them). The 4th Wave: Abu al-Hasan al-Ma'ribee, a former takfiri, ikhwani from Egypt who made his way to Yemen and made a series of visits to some of the Major Scholars. After having gained acceptance and waiting for the passing away of the Major Scholars, he announced his great revolution and began to lay down his principles for the silencing of Ahl al-Sunnah and opening the prison doors for the Hizbiyyeen. His principles were a sophisticated rehash and reformulation of what his predecessors had tried to achieve. He tried to undermine the criticisms and refutations made by the Scholars against Sayyid Qutb and Muhammad al-Maghrawi (and others). His claim that khabar al-aahaad amounts to dhann (laying the foundations to reject the speech and criticism of scholars against innovators), his principle of "verification (tathabbut)" aimed at undermining the criticism of the Scholars and emboldening the youth to reject the advices and directions of the Scholars, his principle of "rejecting taqleed" sounds good until you understand what he meant by it and how he implemented it. His principle of "the broad vast manhaj (al-manhaj al-waasi')" which meant to broaden the manhaj of Ahl al-Sunnah to allow accommodation of Innovators and sects such as al-Ikhwan and others, just another reformulation of the principles of Salman al-Awdah, Abdul-Rahmaan Abdul-Khaaliq and Hasan al-Banna. All of these slogans and principles were another level of sophistication to push the Bannaawitude of Hasan al-Banna, done in a way to escape the stealth radar and hawk-eyes from the Scholars of Ahl al-Sunnah - but this conniving innovator was not successful walhamdulillaah, and today his realities are plain and clear for everyone to see (see his views and opinions over the past few years). The 5th Wave: Then there came Ali Hasan al-Halabi and he was known for Salafiyyah and spoken well of in the 1990s but he took the same path and this was the result of unsavoury connections with Ihyaa al-Turaath, al-Maghrawi, al-Ma'ribee and others. So he began to invent principles in turn in order to defend his own conduct in da'wah of friendship with those whose bid'ah and dalaalah had become manifest and plain, and taking money from Ikhwani organizations such as Ihyaa al-Turaath. Out came his principles, "there must be ijmaa' (consensus) in tabdee'", demolishing thereby 1400 years of the disparagement of Ahl al-Sunnah against the Innovators without there being consensus on the vast majority of them. But the greatest of his principles was the reformulation of the very principle of al-Hasan al-Bannah, so al-Halabi uttered (لا نجعل خلافنا في غيرنا سبباً للخلاف بيننا), "We do not make the differences between ourselves regarding others as a cause of differing between us" - in other words, what al-Halabi is saying that since he and his likes have not taken with acceptance the tabdee' and warnings of the scholars against al-Maghrawi, Ar'oor and other Qutbis, Takfiris, and they claim a "difference of opinion", that such differences such should not be made a cause of differing. In other words, we can accommodate the aqidah of the Khawarij found with Ar'oor and al-Maghrawi, and not make this a cause of differing. And also his saying (لا يلزمني), "its not binding upon me" - meaning that when a Scholar has refuted a deviant with clear evidences and proof and the matter is as clear as night and day, "its not binding upon me" - another way to undermine what the Scholars stand to perform of defending the Sunnah and clearing out the deviants. When you look at the da'wah of al-Halabi, you see his real intent behind these principle, they are to defend bid'ah and its people and justify continued cooperation with them - for whatever personal, financial or da'wah based interests are at stake. Now what was the aim in this little history lesson? The aim was to show that there is a certain orientation and perspective (which we call "Bannaawitude") which is from the poison of al-Ikhwan al-Muslimeen. That there are certain individuals and organizations which are carriers of this poison, and they have sophisticated innovated principles which are alluring and beautified, but which they intend misguidance and draw people into their higher goals and agendas. From such individuals are Abdur-Rahmaan Abdul-Khaaliq, and his students such as Adnaan Abd al-Qaadir, and the Jam'iyyah Ihyaa al-Turaath and its sister organizations and various other fronts they use. They often operate in the guise of jamaa'aat khairiyyah (societies to enjoin good) or societies that collect and distribute zakaah and sadaqah. This is what they were doing in the late 1980s and 1990s, tearing Salafi communities apart through the lure of wealth and financing. They no longer operate as "Ihyaa al-Turaath" because that organizations has been largely exposed. But they operate through charity organizations through which they gain control over other mosques and centres and then they start dictating a certain manhaj. It is the manhaj of the Jam'iyyah, the fikr of Abdur-Rahmaan Abdul-Khaaliq, it is the twin towers of Ikhwaaniyyah and Turaathiyyah. This manhaj requires that your da'wah, your loyalty, your allegiance does not care about distinguishing between truth and falsehood, sunnah and bid'ah, the sunni and the bid'iyy in your da'wah and mu'aamalah (dealings). Rather, you are happy to cooperate with anyone for the purpose of getting as many people as possible within your umbrella, your agenda. This is what Ihyaa al-Turaath was doing in the 1990s and this is what its sister organizations are doing today in the form of charity organizations. They come with the money to mosques and centres to promote "social unity" (another way to describe the manhaj of Hasan al-Banna), the administrations lap up the money, and then we see the Ikhwani, tamyee'ee da'wah emerging from such mosques and centres, where the primary aim has become social solidarity instead of proclaiming the truth and uniting people around it. These people have been making inroads into the da'wah scene in the UK from the mid 1990s, and this manhaj has in fact been operative in the MJAH-GLM complex for a very long time. Today's revelation indicates a culmination of their efforts. We shall elaborate on this further in the article inshaa'Allaah. Adnan Abd al-Qadir: "Green Lane Da'wah Centre Is From the Most Prominent Achievements of the Committee of Shaamiyyah in Britain"
The chief of the Committee (of the Districts) of Shaamiyyah and Shuwaykh pursuant to the Jam'iyyah (Society) of al-Najaat al-Khayriyyah, the Shaykh Adnaan Abd al-Qaadir, emphasized that Green Lane Da'wah Centre which the committee set up in the city of Birmingham in Britain is from the most important and largest of centres and the most important of da'wah projects which the committee has executed outside of Kuwait. This newspaper article reveals that there is (and has always been) a tight connection between MJAH-GLM - one that has often been denied over many years. This connection is not just financial. It is also one of methodology (manhaj) as well. The recent MJAH-GLM conference fiasco discussed in previous articles (see here, here, here, here and here) is connected to this matter. MJAH-GLM have always been upon this manhaj and this includes all factions that make up the MJAH-GLM nexus, the al-Hidaayah faction (who are business people) and the mullah section including Suhaib Hasan, Abdul-Hadi Omari, and the mouthpiece faction, Abu Usamah Khaleefah. This connection helps to explain the direction these people have been taking more openly over the past year or two, which has culminated in them inviting Qutbis, Ikhwanis like Waleed Basyouni and Tawfique Chowdhary to their recent conference. In 1997 when the da'wah of Ikhwaan and Turaath was made clear (largely through the efforts and writings of Shaykh Rabee' bin Haadee), in the da'wah scene in the UK numerous individuals and organizations betrayed their Salafi brothers and chose to remain conducting their da'wah upon the Ikhwani, Turathi principles that were the cause of confusion and lack of clarity prior to that time. They include al-Hidaayah (Na'eem and Sa'eed), the Markaz Jam'iyyah Ahl al-Hadeeth figureheads including Suhaib Hasan and Abdul-Hadi Omari, and individuals such as Abu Usamah Khaleefah. As a result of this betrayal, these people actively worked against those who held fast to the Salafi creed and methodology, who made walaa and baraa around it, and conducted their da'wah upon clarity, seeking uniting the people around it. These Salafis became objects of the numerous wars and battles that were waged by those remaining upon that Turaathi, Ikhwaani da'wah, along with its associated principles and foundations in behaviour and allegiances. It is false and a mistake to try to distinguish between the al-Hidaayah faction and the Mullah faction consisting of Suhaib Hasan, Abdul-Hadi Omari, Shu'ayb Mirpuri and others. They are all upon the same manhaj. Just because Na'eem and Sa'eed (al-Hidaayah, current GLM admin) are running the show now, does not mean they alone can be blamed and scapegoated for what has happened in the recent September conference of inviting dubious, astray individuals to speak on their platforms. Rather, all of them have been upon this manhaj in what has passed. 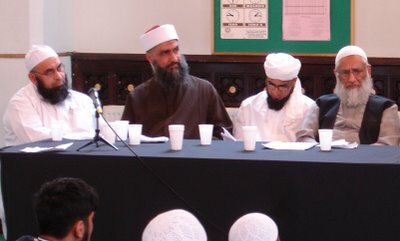 In this specimen we see Abdul-Hadi Omari (the ameer of Jam'iyyah Ahl al-Hadeeth) - in this September conference during the weekend just passed - sat next to the "innovator" Tawfique Chaudhury who put his name to a Sufi pledge initiative along with grave worshippers and Jahmites. He is second from the right, with Tawfique Chaudhury on the far right. This is because Abdul-Hadi Omari has been upon this manhaj himself, it shows that he hasn't really changed from the days he made his remark, "Also, Ahmad Reza Khan from the Brelwee school of thought, who was a great scholar of the religion who has written many books", praising a caller to Shirk. So the point here is that it is false to distinguish between Suhaib Hasan (specimen, specimen, specimen, specimen, specimen) and Abdul-Hadi Omari on the one hand who represent the Ahl al-Hadeeth and al-Hidaayah (or other factions) on the other hand who have a hold in the MJAH-GLM nexus. All of them have been upon that Ikhwani, Turathi manhaj in da'wah. The Markaz Jam'iyyah Ahl al-Hadeeth and Green Lane Mosque complex have been upon the manhaj of Ihyaa al-Turaath and Abdur-Rahmaan Abdul-Khaaliq since the 1990s. They have revealed this on numerous occasions, such as what they wrote in a publication in 1999 indicating whom they consider to be scholars (specimen). Here they put the heads of the Ikhwan and other deviants alongside the Imaams of Salafiyyah. Further, they also explicitly state that their manhaj and the manhaj of Ihyaat al-Turaath is the one and the same and there is cooperation between them (specimen). In this article in al-Furqan magazine (no. 107, twelve years ago), we see one of the figureheads of Jam'iyyah Ahl al-Hadeeth state about Markaz Jam'iyyah Ahl al-Hadeeth and Ihyaa al-Turaath, "Yes, there is cooperation between us, rather it is obligatory upon us to make cooperation because our manhaj is one..."
Since the late 1990s Maktabah Salafiyyah took a clear, firm and unwavering stance with respect to Turaath and after discussions and advice with individuals (including Suhaib Hasan, Abu Usamah, al-Hidaayah) where it became clear these people have agendas and goals and are not willing to make their walaa and baraa around and upon clarity, they began to warn against cooperation with these people, because these people are upon a wishy-washy, murky da'wah in which light is not clear from darkness. Just ask yourself, how does this look: (specimen, specimen, specimen, specimen, specimen). Do those specimens give you the vision of a bright joyful summer's day or a misty, foggy, depressing, dark winter evening? You be the judge, but just be honest and truthful and throw away any hawaa (bias) that you might have. The point here is that Maktabah Salafiyyah took a consistent stance because it was clear these people are betrayers and they are betraying a large community in Birmingham (meaning those attending the Green Lane Mosque) which understands and recognizes the obligation and necessity of following the way of Salaf, in principle at least, but who were and are hindered, and involved in psychological games, and kept in the snares of these treacherous, cowardly people such as al-Hidaayah, Suhaib Hasan, Abdul-Hadi Omari, Abu Usamah Khaleefah and their likes, who are happy to bring Ikhwanis and Qutbis like Waleed Basyouni and Tawfique Chowdhary (who are upon the manhaj of Ali al-Timimi) and put them in front of that community. This is betrayal and deception. All of this has become clear through the fiasco of the September 6th-8th conference. There are a ton more points to follow with historical evidences inshaa'Allaah and you will see a clear picture emerging. Please check back as this article will be updated routinely!